Allied Plumbing was founded in February 2006, by Dave Kiel, Mike Kiel and Karyn Kiel-Skertich. Dave has over 37 years of plumbing knowledge and experience. He started his career in 1971, in 1988 he became a highly respected licensed Plumbing Contractor both in Indiana and Illinois. For the past 30 years he has worked with many of the local builders and homeowners, where he has built both professional and personal friendships. His unsurpassed technical skills combined with his ability to lead a crew of employees by his example, has earned him the outstanding reputation that he has become known for in the industry. Allied Plumbing is a family owned and operated company whose foundation is based on the same high standards that have made Dave a trusted, successful Plumbing Contractor. Mike Kiel has brought with him over 15 years experience as a licensed plumber in both Indiana and Illinois, and is also a licensed Plumbing Contractor. 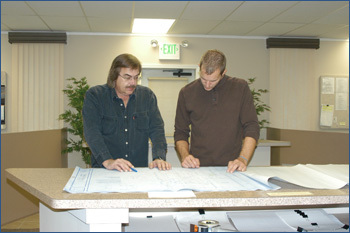 Mike maintains the foundation of Allied Plumbing Services, emphasizing on all overall operations. Both Mike and Dave have built an outstanding base of employees, both in the field and in the office, to ensure the continuation of quality that people have come to expect. Karyn Kiel-Skertich brought with her exceptional executive attributes ensuring quality and professionalism, a true asset to Allied Plumbing Services.